A talking robot and virtual reality headsets are being tested with the elderly, as a partnership between the UW-Milwaukee and a local senior home moves ahead. WUWM's Chuck Quirmbach. A talking robot and virtual reality headsets are being tested with the elderly, as a partnership between the UW-Milwaukee and a Milwaukee-area senior home moves ahead. It's an attempt to see if more technology can improve the health and quality of life for seniors. But it's also an effort to get more nursing school graduates to work at places in need of skilled help. The U.S. Census Bureau says that by 2030, every baby boomer will be over the age of 65. There will also be a nearly 50 percent increase in the number of people 85 and older. While many will try to hold onto their homes, others will choose or need options like senior living centers. 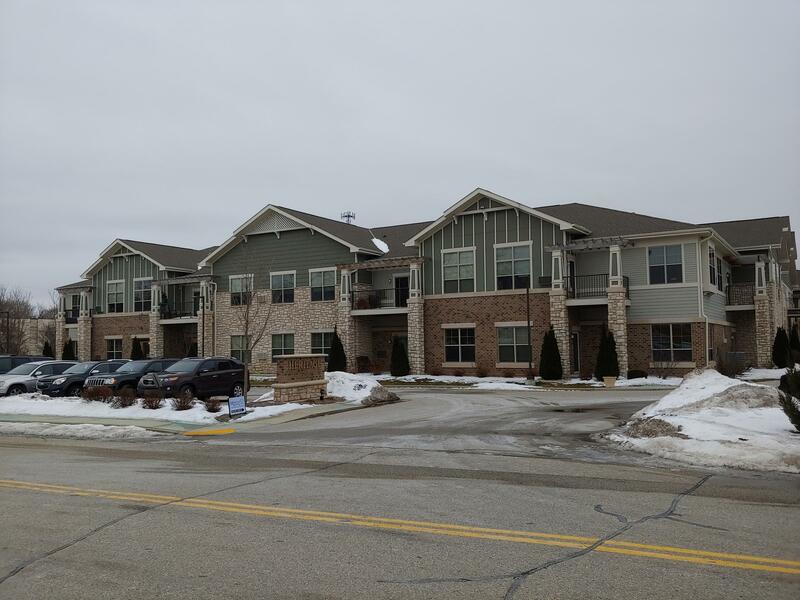 Joan Kulthau lived in Brookfield before moving into Heritage Senior Living in Elm Grove, about a year ago. It's an assisted-living facility — meaning residents can be independent but have help in the building. Kulthau says many other residents need the assistance. "A lot of them need medical care. They're getting forgetful. Some of them don't know where they are, and they get helped a lot," Kulthau says. Under a partnership that started last year between Heritage and the UW-Milwaukee, the helpers in Elm Grove include four nursing students from the university. One of the students, Daniel Dallmann, says he's all about aiding seniors, "And making sure the transition is good, and their needs are being met." Another of those needs can be companionship, so Dallmann is testing the capabilities of a non-human colleague — a black and white, 11-inch tall robot with the name Jibo. Jibo is programmed to talk, too. "Hey Jibo, what's the weather today?" asks Dallmann. After a moment, the robot answers: “Looking at the weather — the mercury is rising, with a high today of 18 and low of 11." But this Jibo isn't programmed to recognize Dallmann's face or voice, so a more complex follow-up question confuses this 5-pound bundle of artificial intelligence. Dallmann asks, "Hey Jibo, is that a heatwave?" Jibo replies, "Um, I don't know what to do with this." Kim Litwack, Daniel Dallmann and Jaime Schwingel sit behind Jibo. 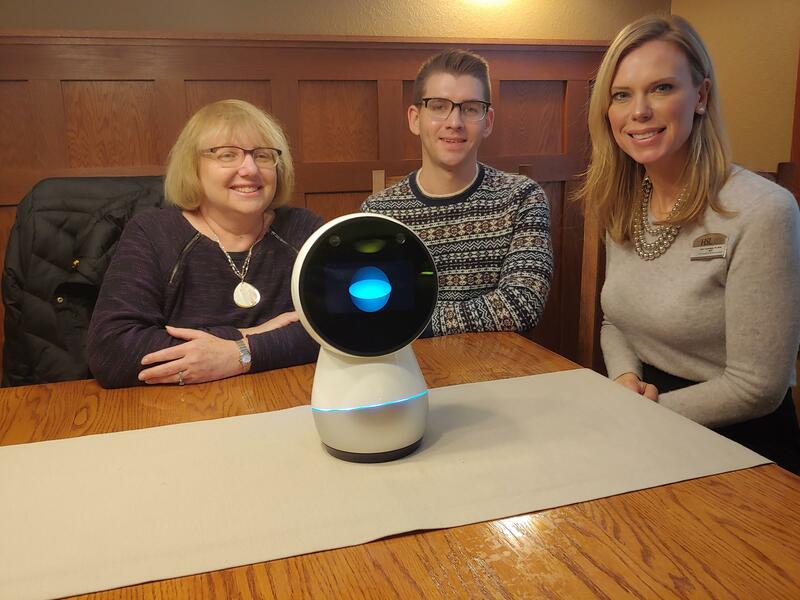 This Jibo does recognize Heritage Senior Living Vice-President Jaime Schwingel, who can get the robot to do much more, including gyrate to music it plays. "Let me put on my dancing shoes," Jibo replies, then proceeds to gyrate as he plays music. Schwingel says after more testing maybe Jibo will be able to remind seniors of their schedule for the day or when to take medication. Or, maybe Jibo will start a conversation. "If I am not taking to Jibo, he will interact with me. He'll say, ‘Hey Jaime, do you want to play a game?’ He'll say, ‘Hey Jaime, do you want to hear the word of the day?’ " Schwingel says. While Jibo is probably the star of this tech experiment, Schwingel says Heritage has also been testing having elderly residents who take anti-anxiety medication wear a virtual reality headset. Staff are on hand, Schwingel says, as a senior is shown scenes that relatives have said the senior typically found relaxing. "Was it the beach? Was it walking in a field? Was it when they went to Paris? Do they like to cook? What reduces anxiety for them?” Schwingel explained, saying one aim is to reduce the amount of prescription drugs the senior has to take. UW-Milwaukee College of Nursing Dean Kim Litwack says she's happy with how the partnership is going. She says her students get exposure to working at a good place for seniors. "The majority are not in hospital-based care. They're in community-based care. I think our ability to put students into that type of environment, where they can not only see what's happening today, but anticipate the future, is huge for us," Litwack says. A future that just maybe will include a Jibo for any senior living resident who wants the companionship of a social robot. Is Milwaukee's Shoot Review Model Reducing Gun Violence? Milwaukee Police Chief Alfonso Morales says there are about 550 Milwaukeeans wounded or killed by bullets each year — a figure he says is unacceptable. Under a recently-installed shoot review model, he brings together various law enforcement agencies, social service groups and others to take a closer look at every shooting. Milwaukee police say the number of non-fatal shootings in the city is down so far this year, compared to January 2018. And recently, city officials announced both "non-fatals" and fatal shootings were down for all 2018, compared to 2017.